On Monday evening representatives from the NSO participated in an Office for National Statistics (ONS) meeting in London regarding the Sikh Federation UK’s ongoing lobbying for the inclusion of a Sikh ‘ethnic’ tick box in the 2021 census. 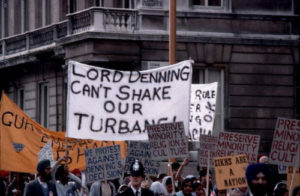 Notably, the ONS informed audience members they had widely consulted Sikh groups, namely the Sikh Federation UK, the Sikh Network and the APPG for British Sikhs. To anyone outside the Sikh community this would on first inspection appear to be something of a community wide consultation. However the truth is all the aforementioned groups are in reality inextricably linked. Perhaps unbeknown to the ONS, Dabinderjit Singh is an advisor to the Sikh Federation UK, founder of the Sikh Network, and the Sikh Federation UK is the current secretariat to the APPG for British Sikhs. Preet Gill MP, Chair of the APPG remains an active board member of the Sikh Network. 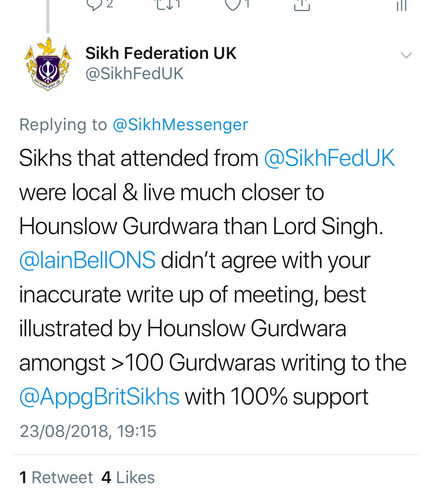 We take the view that this has therefore been far from a representative consultation with British Sikhs, but rather with the Sikh Federation UK, its affiliates and friends. At the start of Monday’s discussion, our Director Lord Singh asked the ONS if they had taken into consideration Sikh teachings, and specifically the edict of Guru Nanak who rejected the labeling of individuals on caste, ethnic, race or any other lines of perceived difference. Sikh teachings emphasise the equality of all human beings. Lord Singh provided a robust Q&A on ‘Sikhs and ethnicity’ to the ONS at the meeting, which can be read here. During the event another NSO delegate raised the issue of evidence-based research on South Asians (Indians, Pakistanis, Bangladeshis and Sri Lankans) that shows they are at more risk of strokes and heart attacks. He said healthcare professionals offer advice on lifestyle modification and prophylactic therapies, and ethnicity is an important risk factor for them to consider. We take the view that in such cases involving cardiovascular risk, it would be irresponsible and furthermore dangerous to deny one’s Indian heritage. The risk factor for a Sikh convert of Caucasian heritage would of course be different. We are confident the ONS will take this into consideration. After careful deliberation, we’ve decided to speak out about some further concerns. In short, we were taken aback by the conduct of some of the delegates at the meeting. Amrik Singh, Chair of the Sikh Federation UK openly boasted that his organisation had previously sued the ONS, spending £10,000 in doing so. He did not however clarify the outcome of the litigation. After the event, some delegates (who have chosen to remain anonymous) informed us how the meeting environment had made them feel intimidated. One was aggressively told to ‘shut up’ in Punjabi. We are aware that some individuals subsequently flagged concerns with the organisers. Regrettably, our Director was also heckled and jeered for simply putting forward his point on Guru Nanak’s teachings. Embarrassingly others accused the ONS of being like some kind of modern day extension of the British Empire, and playing ‘divide and rule’. An attendee told The Sikh Council supremo Gurmel Kandola to leave the room for not respecting the meeting format. Another supporting the Sikh ‘ethnic’ tick box proposal, oddly suggested that the whole idea of Sikhism as a great world religion was an invention of the British. There appeared to be significant numbers of Sikh Federation supporters at the meeting, but regrettably very few Sikh women. We would like to take the opportunity to commend the ONS for their patience, expert facilitation and professionalism at an event fraught with difficulty and tension from the outset. They themselves faced significant vitriol from some of those present. 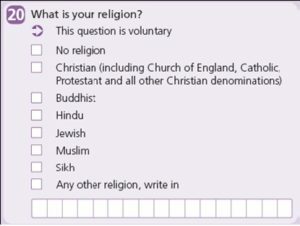 Importantly, the ONS shared their own quantitative research on the Sikh ‘ethnic group’ question, which was conducted with Sikhs in both Hounslow and Wolverhampton this year. These areas were chosen because of their sizeable Sikh communities. Summarising their findings the ONS concluded, there was no indication that the inclusion of the proposed box ‘provides any additional information over the religious question about the Sikh population’. Moreover they said the research, ‘indicated that the religious affiliation question better captures the size of the Sikh population’.